One night you suddenly see a drone hovering next to a window of your home. Outraged, you shoot it down. Somebody calls the police because they heard a firearm discharged, and ten minutes later you hear a knock on your door. Or, say a military plane swoops across your backyard, barely skimming the tops of your pine trees, and you hear a massive crash. You look out your window and see a fully intact missile stuck head first in the ground. Apparently the military accidentally dropped a bomb on your land. Can you do more than shake your fist? The question: Who owns the air above your property? You do. To a limit. In property law, when you purchase land, you own what’s underneath — yes, all the way down to the center of the earth — and the air above it . . . but obviously not to the moon. In short, your property is not just the dirt; it’s also the sky. However, in legalese, you own as much of the air above the surface as you can reasonably use in connection with the surface. But how far up is “reasonable use”? Well, this is where the federal government comes in, which has exclusive sovereignty of U.S. airspace. The operative term is called “navigable airspace” (similar to navigable waters), and Congress delegated to the FAA the authority to define “navigable airspace” however it wantsand the authority to regulate it. Note also the term Minimum Safe Altitude (MSA), which is a generic term that’s used to describe the altitude that’s unsafe to fly because of terrain and/or obstacles. the airplane needs to make an emergency landing, and the pilot must know that landing will not create an “undue hazard” when necessary for takeoff or landing; and in an in-flight emergency requiring immediate action. Government Overreach: How Much Power Over Your Airspace? The above really applies to commercial aircraft. So, how low is too low before the government infringes upon your property? The FAA argues that it has authority to regulate aircraft in U.S. airspace at any altitude because according to Federal law, the FAA can “develop plans and policy for the use of the navigable airspace and assign by regulation or order the use of the airspace necessary to ensure the safety of aircraft and the efficient use of airspace.” This rule is broader than you think (which is no surprise because the government is always stretching the rules). In addition, Congress gave the FAA the authority to prescribe “regulations and minimum standards for other practices, methods and procedure the [FAA] finds necessary for safety in air commerce and national security.” Under this section, the FAA regulates amateur rockets, motorized paragliders, and other vehicles below 500 feet. In other words, Congress has given the FAA nearly unlimited power to use “national security” to violate private owners’ airspace rights. Finally, even if navigable airspace does not extend to the surface, the FAA has argued that it may regulate below navigable airspace because it can prescribe regulations “on the flight of aircraft for navigating, protecting, and identifying aircraft” and “protecting individuals and property on the ground.” While this seems helpful, it effectively gives the government the authority to trespass upon your airspace in order to “protect” whomever is on land. You own at least as much of the space above the ground as you can occupy or use in connection with your land. However, these principles remain unclear, which is why airspace is still a controversial topic. At the moment, the FAA thinks it can regulate any and all airspace under the guise of national security. 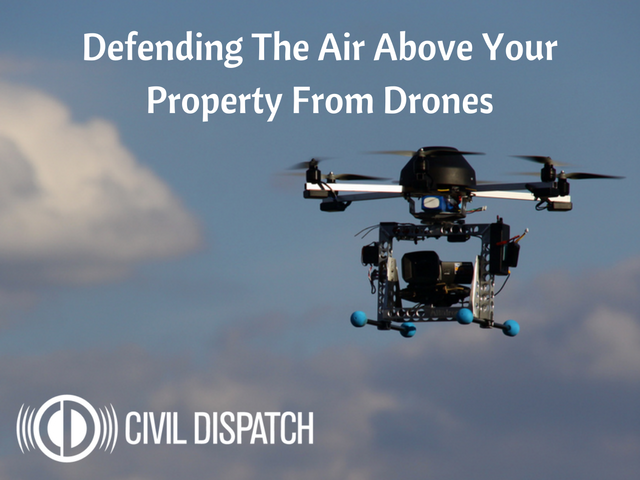 To limit the power of the federal government, the states should oppose the FAA overreach by arguing that regulating airspace below 500 feet is part of their traditional police powers. This still doesn’t solve the issue private property rights, but it’s a closer step to preserve federalism. Today, the hot button issue regarding airspace and privacy is the use of drones. Contrary to large aircraft, drones are quiet, and they often fly well below navigable airspace. As a result of increased drone technology and use (from military surveillance to Amazon deliveries), it’s very possible that “navigable airspace” could be lowered to the point of threatening the traditional airspace rights of property owners.